Until recently, the Port of Nagoya could accommodate container ships of 399m LOA (length overall) or less. However, since December 10, the Tobishima Pier South Side Container Terminal of the Port of Nagoya has been able to accept the world’s largest class container ships of 400m LOA after adjustment of the rules and opinions among the concerned parties. As the total ocean-going cargo volume steadily increases worldwide, container ships have been getting larger, especially those ships connecting Asia, North America and Europe. 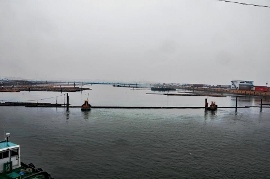 The Tobishima Pier South Side Container Terminal is mainly used for ships on those trunk lines, and to enhance the port’s international competitiveness it is important to keep up with the shipping trend of reducing transport costs by mass transportation of cargo. 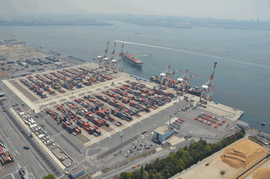 The Port of Nagoya will continue to maintain and improve its functions in order to be selected by users. 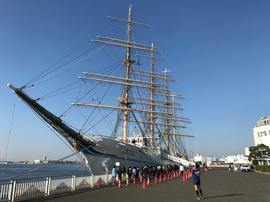 On November 9, the Kaiwo Maru, a sail training ship for seamen, called at Garden Pier. It had been one year since the ship last arrived at the port, and this call of the ship was made to celebrate the Port’s anniversary on November 10. The ship was open to the public and about 5,000 visitors boarded over the two days of November 10 and 11. 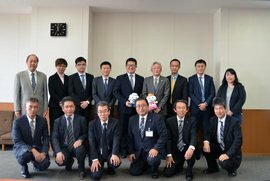 Far East Asia Liner Operations Cluster members of Maersk Line (Mr. Michael Han, Head of Marine, and other members) visited the Nagoya Port Authority on November 4. The Maersk Line is the biggest container shipping company in the world. This visit was made as part of their tour of Japan’s major ports for mutual understanding with Japanese markets. They requested that the Nagoya Port Authority further develop the port facilities to keep pace with the increasing size of container ships. In response to their request, the Nagoya Port Authority explained the Port’s current development plans to strengthen and improve the efficiency of container terminals, including deepening births and constructing quake-resistant berths at the east side of the Tobishima Pier container terminal. Nagoya Port Authority values such exchanges of opinions with port customers and is endeavoring to attract more port users. On October 16, the Nagoya Port Authority signed a Partnership Agreement with HAROPA - Port of Le Havre. This partnership port agreement will play a role in expanding the Port’s business and helping it so act quickly on a practical level. This is the forth such agreement signed by the Port of Nagoya, after similar agreements with Shanghai International Port (Group) Co., Ltd. (SIPG) in November 2011, the Port Authority of Thailand in October 2012 and the Port Authority of Zeebrugge in 2013. 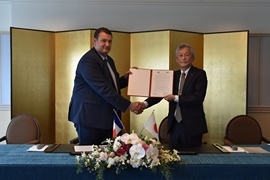 Mr. Hervé Martel, President of HAROPA and Managing Director of HAROPA - Port of Le Havre, and Mr. Akihiko Hattori, Executive Vice President of Nagoya Port Authority, signed the Partnership Port Agreement and exchanged commemorative gifts at a hotel in Nagoya City. 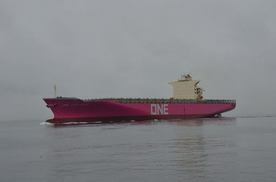 The Port of Nagoya welcomed the Ocean Network Express’s (ONE) first magenta-colored ship ONE CONTINUITY at the Tobishima Pier South Side Container Terminal on September 21. ONE was founded by Japan’s leading shipping companies – Kawasaki Kisen Kaisha, Ltd., Mitsui O.S.K. Lines, Ltd., and Nippon Yusen Kabushiki Kaisha – for the integration of their container shipping businesses. It started operation in April 2018. The ONE CONTINUITY was the first ONE vessel to visit Nagoya featuring the line’s distinctive magenta color. The newly built ship came directly from a shipyard in Kure, and therefore was not loaded with any containers. The appearance of such a container ship was very rare. A harbor clean-up activity was held around the Garden Pier on Marine Day on Sunday, July 8. Marine Day is one of Japan’s national holidays. It is intended to celebrate the sea in the hope of prosperity for the maritime nation of Japan, and to offer thanks for the blessings of the sea. This clean-up activity was held to highlight the significance of Marine Day, with participants collecting litter and cleaning up the coastline together while walking along the shore. This program is held every year with the intention of deepening familiarity with, care for and understanding of the sea. About 100 people including port-related personnel, families and married couples participated in the clean-up. 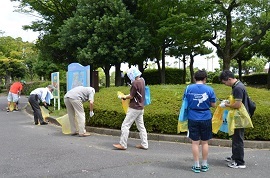 They carefully picked up even small pieces of litter around Garden Pier and Nagoya Port Public Aquarium. A spring tide gates closure drill was conducted at the Garden Pier on May 21. The drill was intended for NPA staff to reconfirm the operational procedure and raise awareness of disaster prevention through the drill of actually closing the gates. 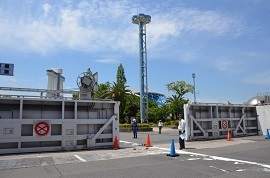 The closing and opening of the gates during the drill were carried out manually and automatically while pedestrians and cars were guided safely. Tide protection walls with a total length of 26.4 km (16.4 miles) are located throughout the Port of Nagoya near the shoreline. The walls are made of concrete, with heights varying from 6.0m to 6.8m above sea level. They were built to protect the lives and properties of local residents from high tides and tsunamis, based on lessons learnt from the storm surge damages suffered in the Ise Bay Typhoon of 1959. The international cruise ship Quantum of the Seas left Kinjo Pier at the Port of Nagoya after 8 pm on April 27. 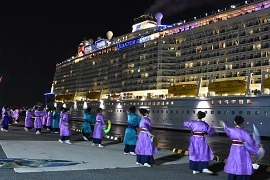 The ship was given a big send-off with a dance performance including glow sticks. As the ship departed, the fluorescent light lent an air of fantasy to the evening darkness. Repair work on the large projector at the aquarium has been completed. The projector images are now full high definition with dramatically improved resolution and color space. 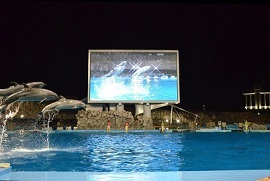 Visitors can now see dynamic jumps by dolphins and other spectacular performances in more vivid detail on the screen. On March 8, an earthquake and tsunami drill was conducted at the west second timber yard. The Port of Nagoya was badly damaged by the high tide caused by the Ise Bay Typhoon in 1959. Based on that experience, a timber yard that can withstand great high tides was built in the west area, which is far from city areas. However, the Port needs to be prepared not only for high tides but also for earthquakes and tsunamis. Therefore, an earthquake and tsunami drill is carried out every year. An emergency communication drill with emergency radios, assuming a scenario in which a major tsunami warning is issued in the Ise and Mikawa Bays, and an earthquake and tsunami drill to close off the opening of the timber yard using the timbers in the yard were conducted. On January 19, a new pure car truck carrier, the TRANS HARMONY 1 (total length: 199.9 m, carrying capacity: 3000 vehicles, constructed by Toyofuji Shipping Co., Ltd.), went into service, making its debut at the Nagoya Port Center in Tokai City. The TRANS HARMONY 1 was designed as people- and environmentally-friendly pure car/truck carrier. The vessel is equipped with systems for enhanced safety and environmental performance. 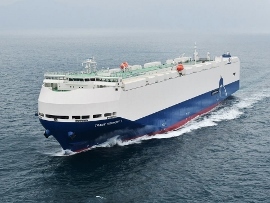 The TRANS HARMONY 1 will serve on the South East Asia route. Another vessel of the same type is under construction, and will go into service around May.